We’d love your help. Let us know what’s wrong with this preview of The Puzzle Lady vs. The Sudoku Lady by Parnell Hall. MAY THE BEST CRIME SOLVER WIN! Cora Felton's peaceful Connecticut town is in an uproar. The "Puzzle Lady's" biggest rival has come all the way from Japan to challenge her in puzzle-to-puzzle combat. And when a local resident is found dead, the battle is on to see who can crack the case first, Cora or Minami. The discovery of another body just adds fuel to the fire, especia MAY THE BEST CRIME SOLVER WIN! To ask other readers questions about The Puzzle Lady vs. The Sudoku Lady, please sign up. Originally liked this series a lot. Funny, irreverent, down-to-earth...Can that wear thin? Am I getting old? Cora seems to be getting annoying, rather than the independent, free-spirit I thought she was. I used to enjoy how "real" Cora was. Now, she seems to be so self-centered, deceitful and conniving. What happened? This is a lighter mystery. Lighter mysteries have their place; I often enjoy them. I'm not sure why this was just a tad unsatisfactory - maybe I've moved on in a sense. Too much lev Originally liked this series a lot. Funny, irreverent, down-to-earth...Can that wear thin? Am I getting old? Cora seems to be getting annoying, rather than the independent, free-spirit I thought she was. I used to enjoy how "real" Cora was. Now, she seems to be so self-centered, deceitful and conniving. What happened? This is a lighter mystery. Lighter mysteries have their place; I often enjoy them. I'm not sure why this was just a tad unsatisfactory - maybe I've moved on in a sense. Too much levity; too much lying; too much sarcasm (can I actually be saying that?). The earlier books are fun. But maybe contrived in a way. A Puzzle Lady that can't solve a puzzle (we're talking crossword puzzles. Her niece constructs crossword puzzles and is a whiz at solving them. Cora is just basically a "front" person; her age basically lending respectability. I loved it when Cora proves to be a whiz at Sudoku. I do poorly at crosswords, myself. I am by no means a whiz at Sudoku, but I know I do so much better at those puzzles and enjoy them more, that I felt a kind of kinship with Cora. But now, I wonder. I couldn't finish the book. The inane way Minami created theories of the murder were totally incredible and,this is just a quibble, I had a hard time with two Japanese ladies getting together for dinner and speaking English. This was too much so I put it down. It was too much to swallow the murder theories plus characters who are forced to follow a plot rather than unveiling the plot. I did enjoy the first in the book in the "Puzzle Lady" series. I wish I could have enjoyed this one. "It's the battle of the century when Minami, the Sudoku Lady, shows up in Bakerhaven, Connecticut, to meet Cora Felton, the Puzzle Lady, whose sudoku books have just edged Minami's off the Japanese bestseller list. Before the rivals have a chance to square off, a killer strikes, and a sudoku puzzle is found at the scene of the murder. Now it's a fight to the finish to se who can unmask the filler. "Cora is eager to undo her Japanese counterpart -- at least until the poor woman is arrested for mur "It's the battle of the century when Minami, the Sudoku Lady, shows up in Bakerhaven, Connecticut, to meet Cora Felton, the Puzzle Lady, whose sudoku books have just edged Minami's off the Japanese bestseller list. Before the rivals have a chance to square off, a killer strikes, and a sudoku puzzle is found at the scene of the murder. Now it's a fight to the finish to se who can unmask the filler. "Cora is eager to undo her Japanese counterpart -- at least until the poor woman is arrested for murder and Cora realizes that she accidentally framed her for the crime. As if that weren't complicated enough, the publicity of her arrest drives Minami's sales through the roof! "Now it's up to Cora to clear her rival's name, get her off the bestseller list, and trap the real killer, but she'd better do it fast, before the cops find out what Cora did and she winds up facing more jail time than Minami. "Boasting an entertaining, fun-filled mystery, as well as several satisfying crossword and sudoku puzzles, the Puzzle Lady['s latest adventure makes for a rollicking good read." wow. this was SO BAD. I only read a few pages at a time to fall asleep. The characters weren't just flat, they were ridiculous stereotypes. the courtroom scene was absurd. I understand it is supposed to be lighthearted but my god this is like cotton candy - terrible for you, unsatisfying, and cloying. Not one of the best in this series, but still amusing. I think I miss the drunk Cora. Very entertaining book and I like trying to solve the crosswords and sudokus. With all the vast number of books that exist in the world, it is always a puzzle to find one to read despite the fact that my taste in reading are so catholic that I can almost walk up to any bookcase and pick any book and enjoy it. That is almost what happened here -- I was at the library looking to see if there were any Charlaine Harris books on the shelves that I have not yet read, and as a word on the title spine of a book on the next higher shelf deep out of me. The word, of course, was sud With all the vast number of books that exist in the world, it is always a puzzle to find one to read despite the fact that my taste in reading are so catholic that I can almost walk up to any bookcase and pick any book and enjoy it. That is almost what happened here -- I was at the library looking to see if there were any Charlaine Harris books on the shelves that I have not yet read, and as a word on the title spine of a book on the next higher shelf deep out of me. The word, of course, was sudoku, which was enough to force me to pull the book off the shelf to look at its front cover and its back cover. The front cover should be the profile view of two ladies, 182 delicate and perhaps too young oriental women in the other a blonde/white-haired Caucasian woman whose features were distorted in an unflattering grimace, with the latter apparently giving the former a tongue lashing of the former maintain an inscrutable sweetness. In addition to providing the title, the front cover informed me that this was "a puzzle Lady mystery" and also that the book included puzzles by Will Shortz. That alone would have been enough to convince me to take the book, but the back cover included extremely complementary comments from reviewers of other books in the Puzzle Lady series. So it was a mystery novel within oriental lady and what the critics promised to be fascinating characters, and it included puzzles by Will Shortz (who, if you do not know, creates extraordinarily difficult sudoku puzzles). I had to take it. It was worth the slight risk. The characters are indeed fascinating, and the conversation between his daylight. The main characters are Cora Felton, the Puzzle Lady, who also creates sudoku and whose latest sudoku book has just become a bestseller in Japan; Minami, who in Japan is known as the Sudoku Lady and who is somewhat upset that Cora's book has just edged her own book off the bestseller list in Japan; Sherry, Cora's niece, with whom Cora lives but who has just gotten married to her newspaper reporter live-in lover, so that the small house beginning to field a bit crowded; Michiko, Minami’s teenaged niece, who is traveling with her art as a translator. Along with these main characters, Hall provides a contingent of minor characters who interact with these during the course of the book. There are two interesting subplots that run through the story: one is Cora, who has a great reputation for creating really difficult crossword puzzles, in fact cannot do crossword puzzles at all; she is great at sudoku but the puzzles that she publishes are created by her niece, Sherry -- conversely, Minami has a big reputation in Japan for creating devilish sudoku puzzles, but she is in fact completely on cable to solve them, and the puzzles that she publishes are in fact created by her niece, Michiko. The other aspect is that both of them have reputations for helping to solve crimes, and the ploy of the novel is that Minimi has come to the United States to see if she can best Cora and thereby win a reputation that will put her sudoku books back on the bestseller list. All they need, of course, is a complicated crime to work on, then one just happens to come along at the time that Minami and Michiko arrive. As if that were not enough, the crime rapidly expands into multiple murders, compounded by the fact that Sherry's ex-husband, who is still trying to get Sherry back gets involved with Michiko. The crime action is complex enough to satisfy most mystery fans, and the book has the added extras of crossword puzzles and sudoku puzzles containing clues to lead the two sleuths to a final conclusion (and which also can be solved by the reader for his/her entertainment, but the real joy of the book is the hilarious dialogue between the characters throughout. This is not great writing by any stretch, but it is witty and entertaining and a fun read -- sufficiently so that I will be looking for other books in the series in the future. The one problem I had with this novel is its continual insistence that Cora can solve sudoku's because of her mathematical skills, whereas Minimi cannot solve them because she does not have any math skills. There is no math involved in sudokus, as my writing instructor so nastily pointed out when I tried to suggest that my protagonist thought there was as A bit of irony in one of my own stories. Since I could not get away with it for a moment of sarcasm, it is bothersome to see a published writer continually repeating the claim seriously. I don't think there's any such thing as a Puzzle Lady mystery that doesn't, at the very least, keep you laughing throughout. Parnell Hall is a master of the ping-pong conversation, in some instances even surpassing Lawrence Block (sorry, Larry, gotta share the limelight a bit). In this, the eleventh in the series (the first is A Clue for the Puzzle Lady), the brilliantly volatile Cora Felton -- famous as the Puzzle Lady, despite the fact that she couldn't solve one if she wanted to, and that her I don't think there's any such thing as a Puzzle Lady mystery that doesn't, at the very least, keep you laughing throughout. Parnell Hall is a master of the ping-pong conversation, in some instances even surpassing Lawrence Block (sorry, Larry, gotta share the limelight a bit). In this, the eleventh in the series (the first is A Clue for the Puzzle Lady), the brilliantly volatile Cora Felton -- famous as the Puzzle Lady, despite the fact that she couldn't solve one if she wanted to, and that her niece Sherry Carter is actually the brains behind the image -- gets a challenge from her Japanese counterpart, the Sudoku Lady, to solve a crime. By the time things get going, there are three bodies, several sudoku, a crossword, and Cora accidentally framing the Sudoku Lady for the whole shebang. I can't believe "The Puzzle Lady vs. 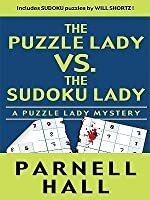 The Sudoku Lady" is the eleventh book in Parnell Hall's Puzzle Lady mysteries! While the books can seem a bit formulaic after awhile, the characters and fun dialogue are what keeps me coming back for more. As much as I love crosswords, I don't even bother to try and solve the ones in the books anymore as I'm too impatient to get on with the story. A treat for puzzle lovers is that many big names are involved in the constructing and editing of those found in t I can't believe "The Puzzle Lady vs. 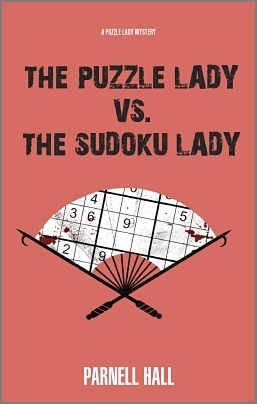 The Sudoku Lady" is the eleventh book in Parnell Hall's Puzzle Lady mysteries! While the books can seem a bit formulaic after awhile, the characters and fun dialogue are what keeps me coming back for more. As much as I love crosswords, I don't even bother to try and solve the ones in the books anymore as I'm too impatient to get on with the story. A treat for puzzle lovers is that many big names are involved in the constructing and editing of those found in the stories. The plot gets too convoluted at times but, overall, the books remain to be breezy fun reads. Cora Felton, the Puzzle Lady, finds herself challenged to a sudoku duel when Minami, the Sudoku Lady, comes from Japan after Cora’s sudoku book tops her own on the Japanese bestseller list. When several deaths occur, the first possibly accidental and the others murder, the two race to outdo each other and solve the crime, and the acerbic Cora becomes annoyed as Minami always seems to be one step ahead of her. When Minami ends up in jail after Cora accidentally frames her, Cora feels compelled to Cora Felton, the Puzzle Lady, finds herself challenged to a sudoku duel when Minami, the Sudoku Lady, comes from Japan after Cora’s sudoku book tops her own on the Japanese bestseller list. When several deaths occur, the first possibly accidental and the others murder, the two race to outdo each other and solve the crime, and the acerbic Cora becomes annoyed as Minami always seems to be one step ahead of her. When Minami ends up in jail after Cora accidentally frames her, Cora feels compelled to solve the crime and clear her. Interesting, well-drawn characters and sudoku puzzles to solve add to the mystery as the reader also catches up with Cora and her newlywed niece Sherry in this eleventh in the series. Those who appreciate all types of puzzles will also enjoy Shelley Freydont’s Katie McDonald mysteries where Katie owns a puzzle museum, and puzzles are an integral part of the solution to the mystery. Cora Felton meets her Japanese counterpart as a mysterious death happens in town. Now it's a race for honor to solve the crime. There's plenty of humor in this book, and the story is pretty good. But the characters are getting stale, especially Dennis. Enjoyable, but most for the fans. Read my full review at Carstairs Considers. This was a quick read, that's all that I can say to recommend it. I have read all of the Puzzle Lady books and for the most part they have been 2-3 stars. This was no different. The whole book was so convoluted that I almost gave it a one star--and I may go back and change it to that at some point. I like the main character, Cora and that is the only reason I keep reading the series. This one makes me want to change my mind about continuing the series. Fast paced dialogue, in a challenging mystery and a heroine that doesn't get herself in stupid situations. Well except for having to clear her rival on murder charges that she accidentally framed her for, and maybe one or two other minor ones. But not really stupid ones. Any ways as I was saying fast paced, witty, zany they all come to mind with this book. Hard to put down. I'm not a fan of this class of tidy murder mystery stories. This book included Will Shortz puzzles that were worked into the story, so that was a small draw. The puzzles were too easy, and the story was only okay. Not sure I liked the portrayal of the Japanese "Sudoku Lady." I'll try to remember to avoid this genre in the future. This was a really stupid book... not sure why or how I read the whole thing. I was drawn to it on the library shelf because of its unique title and its label "Christian Fiction." It is NOT Christian Fiction - that is an error on the library's part. Anyway, it gets two stars instead of just one because it was obviously good enough that I read the whole thing... but I don't recommend it! I thought I would enjoy this book, as I am a puzzle fanatic. But I found that the writing style (almost exclusively dialogue) made it hard to get into the story. I finished the book, but only because I challenge myself to not abandon books. My first book from the puzzle lady mysteries and it made me laugh so much. I really did enjoy it. I was very disappointed in this book. As a matter in fact before I wrote this review, I checked to be sure it was not written for the pre-teen audience. It was not, but them quality of the book made me think so. It was poorly written, poorly constructed, and poorly plotted. Only 2 stars, simply because it seemed like most of the book was Cora talking, rather than doing. The courtroom scene particularly dragged--unfortunately it was the scene used to solve the mystery and finish up the book. Some of her others are better. I loved the Sudoku Lady and that she and Cora shared the same secret--their nieces wrote their columns/books and they couldn't do them at all with the exception that Cora did all the Sudoku as Sherry can only do crosswords. I like this series and think that the "Puzzle Lady" is a hoot as was the "Sudoku Lady" but I thought that the ending was hard to believe even in a cozy mystery.